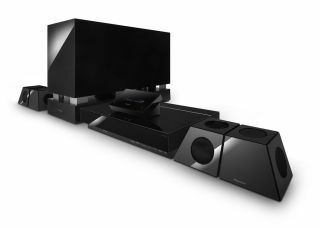 Pioneer has released some new information on its new LX01 Home Cinema System, a unique surround sound system that shares the glossy black aesthetics of Pioneer's own 8G Kuro plasma TVs. First seen at a Pioneer launch event in May, the LX01 includes a 250GB Hard Disk DVD Recorder with digital terrestrial tuner, HDMI with 1080p scaling and a dual-drive subwoofer receiver. It also has four distinctive three-dimensional shaped satellite speakers which feature "speaker design technology unique to Pioneer". "Discerning consumers expect the best in home entertainment; but sometimes manufacturers may overlook the aesthetic element in creating a complete entertainment solution. With the LX01, we've combined the best in technology with the best in design, to deliver a solution that looks like one, coherent piece," says Philippe Coppens, manager of technology at Pioneer Europe. The LX01 has two front/centre speaker combos and two rear speakers, each of which has a distinctive three-dimensional shape. And using the dodecahedron (12-sided) speaker concept, the speakers apparently manage to deliver an 'omni-directional' sound. Conventional speakers generate directional sound, whereas these three-dimensional speakers generate sound fields in all directions. The effect is supposed to be very similar to musical instruments being played in a live performance. The LX01's subwoofer-receiver has dual-drive bass drivers, which are designed to enable more powerful handling of lower frequencies. This should help it pump out a more well-rounded, rich, full-bodied sound. The LX01 also has an integrated digital terrestrial tuner and 250GB hard disk. Besides being a fully-fledged DVD recorder with Showview electronic programme guide, the system will play every kind of commercially available CD and DVD, as well as most compressed media formats. The system also has an extended Music Library feature - you'll be able to use the LX01 to store your favourite tracks and albums on the hard disk. It will also automatically add track and album titles using the Gracenote CD database (formerly CDDB). Conveniently, a USB keyboard can also be connected directly to the LX01, useful in renaming titles and tracks. Last but not least you'll be able to connect the Pioneer Blu-ray disc player via HDMI. And the LX01 will not only turn into a Dolby TrueHD and DTS-HD-capable amplifier, but swiftly pass on the 1080/24p video to your flat screen TV. The Pioneer LX01 goes on sale in October.